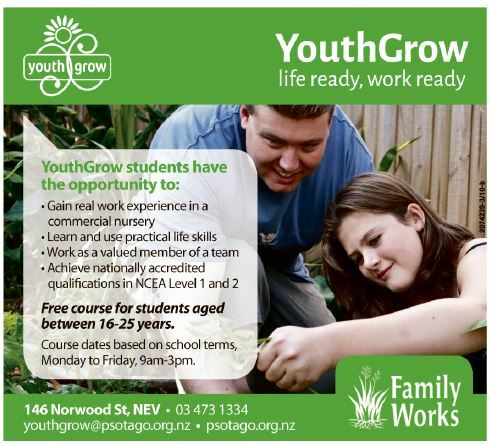 YouthGrow is part of Family Works in Dunedin. They provide an environment where young people grow and learn, transitioning towards their next step on their journey. It is based in a working nursery. YouthGrow’s heart is for impacting youth positively, and remains the same today as it was when they began in 2001. It works with young people between 16 and 25 years of age with the aim of developing the whole person, providing opportunities to strengthen education, life skills, health and wellbeing, and vocation-focused learning. YouthGrow is not just about learning a few gardening skills. In fact, gardening is just one tool that helps with learning. Many of the students work towards NCEA levels 1 and 2, or gaining transferable employment skills. More than 200 young people have participated in YouthGrow since it opened. Their stories demonstrate the success of this important programme. Talking with students, you get an appreciation for the real sense of the achievement that comes from being part of YouthGrow. ‘‘YouthGrow has given me more skills and confidence. I am now applying for jobs and getting work placements on my own,’’ student Hannah said. YouthGrow wants young people to become confident and ready to take the next step in their journey. For more information contact YouthGrow on (03) 473-1334 or email youthgrow@psotago.org.nz.